The Displaydata team recently returned from another successful Retail Business Technology Expo (RBTE) in London – known as Europe’s “must visit” event for those in the retail, hospitality, travel, entertainment and leisure industries. This year, more than 16,000 attendees heard nearly 200 speakers, getting up to date with all the latest solutions and learning first-hand from the best and brightest organizations around the globe how technology solutions have increased productivity, reduced costs, attracted more customers and improved the customer experience. Our team spent a week in Germany at the end of February, teaming up with our partners from Delphi Technologies at the popular EuroCIS 2016 Conference. Now that we’ve settled back into the regular swing of things after a great trip, we wanted to take a moment to reflect on our experience. And so, another successful NRF Big Show is in the books! This year’s conference hosted over 33,500 attendees previewing the latest in retail technology and innovative ideas. From our perspective, the main themes of the show seem to revolve around digital innovations and most importantly, making the customer the focus. In keeping with NRF tradition to launch never-before-seen technology solutions, the Displaydata team was proud to announce the newest additions to our ESL suite: the Aura 29 BLE with Bluetooth Low Energy, the Chroma 16 and the Chroma 74. We also showcased our new ability to track in-store customer behavior through our partnership with SmartFocus, complete with an eye-catching wine display that some lucky winners were able to enjoy the contents of with our #NRFWineDown drawing on the last day of the show. At retail’s BIG Show next week, retailers will gain insight into the latest technology solutions to help make their stores and retail channels more profitable and provide their customers with “out of this world” shopping experiences. By now we all know that offering in-store digital engagement options to today’s connected customer is a necessity sooner rather than later – what can retailers do to offer these interactive, engaging and personalized solutions to customers while also adding to the bottom line and increasing the operational efficiency of the retailer? Look no further than the electronic shelf label, or ESL. NRF is quickly approaching, and the entire Displaydata team is looking forward to another great show in New York. As always, Retail’s BIG Show – a four-day event – offers unparalleled education, collegial networking and an enormous EXPO Hall full of the latest in retail technologies and solutions. It really is THE one-stop-shopping event for industry professionals from around the world. Displaydata is excited to again showcase our industry-leading, full-graphic electronic shelf labels in booth #4343. In addition, next month we’ll be making some exciting announcements on the availability of a new Aura 2.9 inch, Bluetooth Low Energy (BLE) ESL, as well as a preview of our newest sized Chroma labels. Stay tuned in for more details on our new ESLs in early January! In the meantime, below is an overview of the NRF sessions that our team is most looking forward to attending. When it comes to their customers, the phrase “getting to know you” is certainly on the minds of the savviest of retailers all day, every day. Not every shopper is going to fit into a perfect bucket of when and where they like to shop, but if retailers take the time to look close enough, certain patterns will begin to emerge. 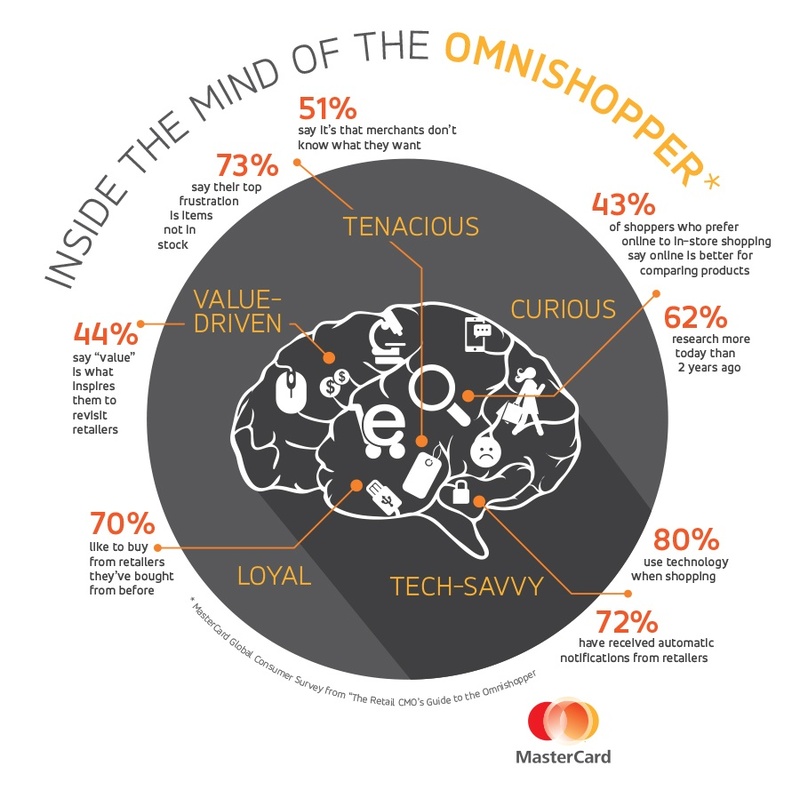 In a recent survey of over 10,000 shoppers across 11 countries, MasterCard set out to define the behaviors and attitudes of consumers who purchase both online and offline within a 30-day period. As we head into the official start of the holiday season, shoppers are not the only ones with wish lists of the gifts they’d like to see under the tree on December 25. Retailers have their wish lists too, but not in the form of big packages tied with red ribbon. This year, a large majority of retailers want (and need) to take the first step on their digital store journey by filling up their stockings with “must have” digital solutions that will give their customers the unique, personalized experiences they crave. RIS News recently published the report “Complete Your Omnichannel Transformation: Digitize the Store,” sponsored by Displaydata, detailing how retailers can truly create a true omni-channel experience by blurring the lines between online and physical shopping channels. As with any new initiative, retailers need to follow an actionable plan. According to RIS News, “Digitizing the store for technology-sake is not going to support an omni-channel approach. Instead, brands need to use a digital strategy as a means of personalizing the customer experience and creating store-level engagement that can truly define the brand.” We couldn’t agree more! The concept of the physical retail store is certainly changing and evolving, in some cases, it may not even be a traditional “store” with four walls and a POS. (Hello, pop-up stores and fashion/apparel trucks!) But I think we can all agree that the store is (in the immortal words of pop singer Taylor Swift) never, ever, ever going to go away. Need some proof? Let’s first take a look at the stats from this year’s back to school shopping. According to a June 2015 poll by FatWallet.com, 91% of parents planned to shop for back-to-school items in-store this year, vs. 37% who cited retailer sites, 16% cash-back sites and 7% mobile shopping apps. What’s more, a July 2015 study by Deloitte asked U.S. parent Internet users about the back-to-school items they planned to purchase in-store vs. digitally - almost all the categories were largely labeled as in-store-only purchases. The Deloitte study also reported that approximately two-thirds of parents intended to make other fashion purchases such as accessories and clothes solely in stores. (The first day of school outfit is very important for so many kiddos!) Clearly, in-store shopping is a priority for shopper’s today.